JNPG Simulator Pass Trial is now available in the JNPG game's Pro Shop or PP social site. Price is $20 per week. You can cancel at anytime via your steam panel/account/manage subscriptions/Cancel. Steam overlay must be enbled. Once purchased, you'll be able to connect the GC2 to PG via PG's BT connection or by using OGT Interface. 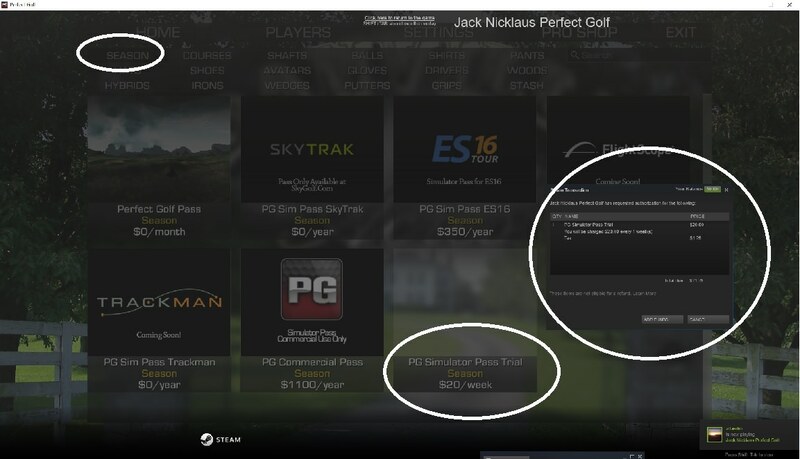 You will need to purchase the Jack Nicholas Perfect Golf game on Steam for a one time fee of $34.99. You will be able to play all standard courses as well as any of the over 200 downloadable user created courses. Contact Zmax for OGT interface and tour trial access.